The traditional definition of literacy is considered to be the ability to read and write, or the ability to use language–to read, write, listen, and speak. In modern contexts, the word refers to reading and writing at a level adequate for communication, or at a level that enables one to successfully comprehend and communicate in print society, thus literacy plays a role in providing access to power. The United Nations Educational, Scientific and Cultural Organization UNESCO has drafted the following definition: "Literacy is the ability to identify, understand, interpret, create, communicate and compute, using printed and written materials associated with varying contexts. Literacy involves a continuum of learning to enable an individual to achieve his or her goals, to develop his or her knowledge and potential, and to participate fully in the wider society." The standards for what constitutes "literacy" vary, depending on social, cultural and political context. For example, a basic literacy standard in many societies is the ability to read the newspaper. Increasingly, many societies require literacy with computers and other digital technologies (see: Literacy in the Information Age: Final Report of the International Adult Literacy Survey, OECD 2000. PDF). There is debate about the way in which the term "literacy" can be extended. In the United States, the National Council of Teachers of English and the International Reading Association have added "visually representing" to the list of communicative competencies that are considered to constitute literacy. Similarly, in Scotland, literacy has been defined as: "The ability to read and write and use numeracy, to handle information, to express ideas and opinions, to make decisions and solve problems, as family members, workers, citizens and lifelong learners." These definitions of literacy are not universally embraced. Many scholars speak of literacy in terms of the ability to "read, write, spell, listen, and speak." Many policy analysts consider literacy rates a crucial measure of a region's human capital. This claim is made on the grounds that literate people can be trained less expensively than illiterate people, generally have a higher socio-economic status and enjoy better health and employment prospects. Policy makers also argue that literacy increases job opportunities and access to higher education. In Kerala, India, for example, female and child mortality rates declined dramatically in the 1960s, when girls were educated in the education reforms after 1948 began to raise families. Recent researchers, however, argue that correlations such as the one listed above may have more to do with the effects of schooling rather than literacy in general. Regardless, the focus of educational systems worldwide include a basic concept around communication through text and print, which is the foundation of most definitions of literacy. Illiteracy is most prevalent in developing countries. South Asian, Arab and Sub-Saharan African countries are regions with the highest illiteracy rates at about 40 to 50%. East Asia and Latin America have illiteracy rates in the 10 to 15% region while developed countries have illiteracy rates of a few percent. Within ethnically homogeneous regions, literacy rates can vary widely from country or region to region. This often coincides with the region's wealth or urbanization, though many factors play a role. The history of literacy goes back several thousand years, but before the industrial revolution finally made cheap paper and cheap books available to all classes in industrialized countries in the mid-nineteenth century, only a small percentage of the population in these countries were literate. Up until that point, materials associated with literacy were prohibitively expensive for people other than wealthy individuals and institutions. For example, in England in 1841, 33% of men and 44% of women signed marriage certificates with their mark as they were unable to write. Only in 1870 was government-financed public education made available in England. What constitutes literacy has changed throughout history. It has only recently become expected and desirable to be fully literate and demeaning if you are not. At one time, a literate person was one who could sign his or her name. At other points, literacy was measured by the ability to read the Bible. The benefit of clergy in common law systems became dependent on reading a particular passage. September 8th was proclaimed International Literacy Day. Literacy has also been used as a way to sort populations and control who has access to power. In the United States following the Civil War, the ability to read and write was used to determine whether one had the right to vote. This effectively served to prevent former slaves from joining the electorate and maintained the status quo. From another perspective, the historian Harvey Graff has argued that the introduction of mass schooling was in part an effort to control the type of literacy that the working class had access to. That is, literacy learning was increasing outside of formal settings (such as schools) and this uncontrolled, potentially critical reading could lead to increased radicalization of the populace. Mass schooling was meant to temper and control literacy, not spread it. The slow spread of literacy in the ancient world. The dark blue areas were literate at around 2300 BCE. 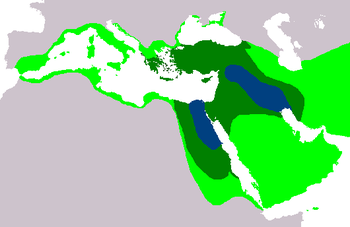 The dark green areas were literate at around 1300 BCE. The light green areas were literate at around 300 BCE. Note that other Asian societies were literate at these times, but they are not included on this map. Note also that even in the colored regions, functional literacy was usually restricted to a handful of ruling elite. In the Middle Ages, literacy rates among Jews in Europe were much higher than in the surrounding Christian populations. Most Jewish males learned to read and write Hebrew, at least. Judaism places great importance on the study of holy texts, the Tanakh and the Talmud. In New England, the literacy rate was over 50 percent during the first half of the 17th century, and it rose to 70 percent by 1710. By the time of the American Revolution, it was around 90 percent. This is seen by some as a side effect of the Puritan belief in the importance of Bible reading. In Wales, the literacy rate rocketed during the 18th century, when Griffith Jones ran a system of circulating schools, with the aim of enabling everyone to read the Bible (in Welsh). It is claimed that, in 1750, Wales had the highest literacy rate of any country in the world. Historically, the literacy rate has also been high in the Lutheran countries of Northern Europe. The 1686 church law (kyrkolagen) of the Kingdom of Sweden (which at the time included all of modern Sweden, Finland, and Estonia) enforced literacy on the people and a hundred years later, by the end of the 18th century, the literacy rate was close to 100 percent. Even before the 1686 law, literacy was widespread in Sweden. However, the ability to read did not automatically imply ability to write, and as late as the 19th century many Swedes, especially women, could not write. This proves even more difficult, because many literary historians measure literacy rates based on the ability that people had to sign their own names. Literacy comprises a number of subskills, including phonological awareness, decoding, fluency, comprehension, and vocabulary. Teaching each of these subskills is needed for students to become highly proficient readers. The most basic instruction is instruction in merely pronouncing the words in text. The difficulty of this process varies by language according to the writing system used. There are two main components to teaching children to read languages that use alphabetic writing systems. The first is called phonological awareness. ( Phonemic awareness is a subset of phonological awareness, but the two terms are often used interchangeably.) Children must learn to attend to the individual sounds in spoken words before they will be successful in reading printed words. Children who struggle to hear sounds in spoken words often have difficulty learning to read. Therefore, many programs for preschool children now teach phonological awareness skills so students will be able to attend to the sounds in words when they begin school. In addition to attending to the sounds in words, novice readers must learn ways to "attack" unknown words. The most common methods used for teaching children to pronounce printed words are called phonics and whole language. Phonics is an instructional technique that teaches readers to attend to the letters or groups of letters that make up words. So, to read the word throat using phonics, each grapheme (a letter or letters that represent one sound) is examined separately: th says /θ/, r says /ɹ/, oa says /oʊ/, and t says /t/. A common way to teach this is to have the novice reader pronounce each individual sound and "blend" them to pronounce the whole word. This is called synthetic phonics. There are various methods for teaching phonics. There are many programs that use this approach. A widely-known program is SRA/McGraw-Hill's DISTAR program (now called Reading Mastery). The Orton-Gillingham method, Lindamood-Bell Phoneme Sequencing Program, and the Wilson reading system are other phonics programs. Because English spelling violates the alphabetic principle in many words, advocates of whole language recommend that novice readers should learn a little about the individual letters in words, especially the consonants and the "short vowels." Teachers provide this knowledge opportunistically, in the context of stories that feature many instances of a particular letter. This is known as "embedded phonics." Children use their letter-sound knowledge in combination with context to read new and difficult words. Programs that use a whole language approach include Reading Recovery and Guided Reading. The answer to this question is often debated. Scientific research in reading has tended to support the value of teaching phonics, although reading experts from all perspectives believe that time spent reading--a key element of whole language--is very important. Advocates of whole language have dismissed this scientific research for many different reasons. One common complaint is that scientific education researchers rely on randomized studies (similar in design to those done in medicine) and do not value descriptive research that has demonstrated the value of whole language approaches. In the United States, the National Reading Panel was an attempt to determine which approach was best. It found that phonics was more effective than embedded phonics or no phonics, but it only used experimental and quasi-experimental research (it did not include qualitative research), so the whole language community remained skeptical of its conclusions. There is no definitive answer to this question. Most educators believe that children need to learn to analyze text (comprehend it) even before they can read it on their own. So, comprehension instruction generally begins in pre-Kindergarten or Kindergarten. Traditionally, comprehension lessons consisted of students reading aloud and then the class answering questions as a group or writing responses on their own. In the last ten years, research has found that teaching novice readers a bank of "reading strategies," tools to analyze text. There is not a definitive set of strategies, but common ones include summarizing what you have read, monitoring your reading to make sure it is still making sense, and analyzing the structure of the text (e.g., the use of headings in science text). Teachers who use phonics and teachers who use whole language both usually teach comprehension. The conditions for whether one has achieved a certain state of "literacy" differ depends on who is defining the standard and why. For one attempt to define a standard of literacy, see . The higher the level of literacy a person has, the more they are able to earn. You can see a graph showing this relationship at The Phonics Page. This relationship is contested by literacy researchers such as Brian Street; he points out that the socioeconomic level of a family has less to do with a child's literacy levels than other variables in their social context, for example class, ethnicity, region etc. Street would argue that the graph shows correlations rather than cause/effect relations. Many have been concerned about the illiteracy in the world population, despite the fact that literacy rates have increased steadily over the past few decades, especially in the third world. Third world nations which adopted Marxist ideology (China, Cuba, and Vietnam, for example), experienced some of the most dramatic growth of literacy, approaching Canadian and European rates. The United Nations defines illiteracy as the inability to read and write a simple sentence in any language. 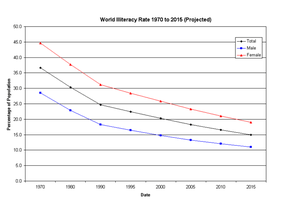 Figures of 1998 show that 16% of the world population is illiterate (by the UN definition). In 2003, the National Assessment of Adult Literacy (NAAL), conducted by the US Department of Education, found that fourteen percent of American adults scored at this “below basic” level in prose literacy. More than half of these persons did not have a high-school diploma or GED. 39 percent of persons at this level were Hispanic; 20 percent were black; and 37 percent were white. According to the National Centre for Education Statistics, "results showed that the average quantitative literacy scores of adults increased 8 points between 1992 and 2003, though average prose and document literacy did not differ significantly from 1992. Among blacks, average prose literacy scores increased by 6 points and average document literacy scores rose by eight points between 1992 and 2003. The average prose scores of Asians/Pacific Islanders increased as well, rising 16 points between 1992 and 2003. The average prose literacy scores of Hispanics fell 18 points from 1992 to 2003, while average document literacy scores decreased by 14 points. Average prose and document literacy scores among whites did not change significantly." Literacy among college graduates declined between 1992 and 2003, with less than one-third of all graduates at the highest “proficient” level in 2003, and less than half of all graduates with advanced degrees at this level. Seven million UK residents are functionally illiterate, according to government figures. Another problem in the developed countries is the rise of secondary and tertiary illiteracy in recent years, i.e. the complete or partial loss of previously existing reading and writing skills due to lack of practice. Among the Arab states, 19.8% of men and 41.1% of women were not literate as of 2006. In India, illiteracy is widespread. As of the 2001 census, the literacy rate in India was only 65.5 %, leaving 34.5 % of India illiterate (unable to read and write even simple sentences in their native language) . Many Indians have argued that this widespread illiteracy, especially in the rural areas, gives undue advantage to contemporary politicians, who can keep on neglecting real issues of socio-economic development, and continue with corruption . India's illiteracy, in part, is due to its colonial history; when India achieved independence from the United Kingdom, its literacy rate was only 18 % (1951 census) . New Literacy Studies researchers argue that literacy is not autonomous or a set of discrete technical and objective skills, such as reading and writing, that can be applied across context. Instead what counts as literacy is determined by the cultural, political, and historical contexts of the community in which it is used. Definitions of literacy are based on ideologies. Scholars associated with the New Literacy Studies include Brian Street, Deborah Brandt, James Paul Gee, Allan Luke, Colin Lankshear and Michele Knobel to name a few. The New Literacy Studies draw across academic disciplines including cultural anthropology and linguistic anthropology. New literacies such as critical literacy, media literacy, visual literacy, computer literacy, multimedia literacy, information literacy. health literacy, and digital literacy are all new literacies that are being introduced in contemporary literacy studies and media studies. For the contemporary world, literacy now comes to mean more than just the ability to read, write and be numerate. It involves, at all levels, the ability to use and communicate in a diverse range of technologies. Since the computer and the Internet became mainstream in the 1990s, its importance and centrality in communication has become unassailable. Therefore, images and sounds have become just as important as words and numbers in their ability to communicate ideas. We should now, properly, speak of "literacies", and these literacies always involve technology and the ability to use technology to negotiate the myriad of discourses that face us in the modern world. These literacies concern using information skillfully and appropriately, and are multi-faceted and involve a range of technologies and media. One such group of literacies that is growing in significance as personal computers become more powerful is multimedia literacy. In sum, today's students need to cope with a complex mix of visual, auditory, oral, and interactive media as well as traditional text. People of lesser education or older people may see themselves falling behind as the informational gap between them and the people literate in the new media and technologies widens.